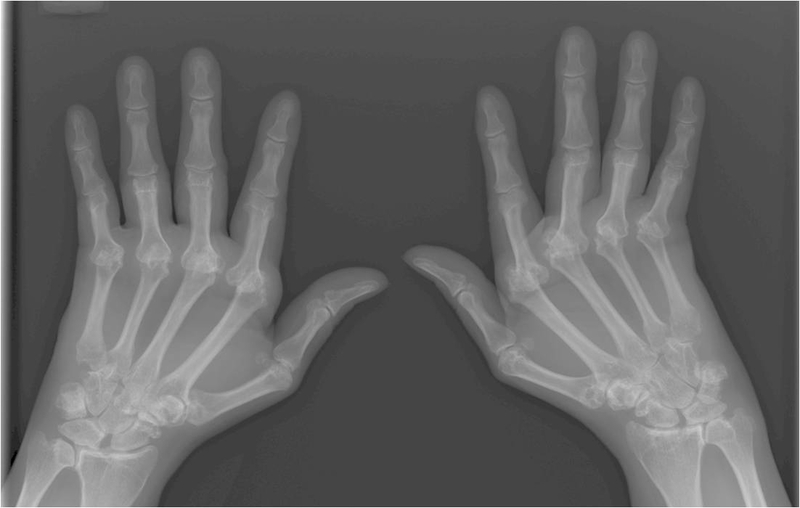 X-ray image of the hands of a patient with rheumatoid arthritis. Note that the joints at the base of the fingers are eroded — and some, like the index finger on both hands, are actually dislocated. Copyright (2012) American College of Rheumatology. About 1.5 million  people in the US suffer from rheumatoid arthritis (RA). It is a chronic illness in which the immune system, which protects us from viral and bacterial invaders, turns on our own body and viciously attacks the membranes that line our joints. The consequences can be excruciating: pain, swelling, stiffness, and decreased mobility. Over time, the joints can become permanently contorted, as in this X-ray image. There are several RA medications on the market, but I want to tell you about a new one called tofacitinib, a pill which the FDA approved late last year . The drug works by targeting a protein called Janus kinase 3, which was discovered by John O’Shea and colleagues here at the National Institute of Arthritis and Musculoskeletal and Skin Diseases (NIAMS) 20 years ago . As I mentioned in a previous post it takes a really long time to go from a basic discovery to a drug—in most cases nearly 15 years. This drug has been even longer in the making! Shortly after discovering Janus kinase 3 in 1993, NIAMS researchers also revealed its role in inflammation, leading to a public-private collaboration with Pfizer that has now culminated in the approval of tofacitinib.